Anyone who’s on Facebook knows that our friends’ status updates can range from the genuinely heartwarming (“Baby Girl born at 8:22am! Everyone healthy!”) to the sublimely mundane (“Just ate pasta for lunch. It’s raining out.”). Which post would you rather see? Follow these eight best practices for Facebook business page posts to keep your customers coming back for more. As a Facebook Business Page owner, you want to create posts that will resonate with your Facebook followers. Some of the questions you should be asking yourself are, how often should I post? What should I post? What does a successful page post look like, and how can I make that happen? Facebook provides some very helpful answers, and I’m here to break them down for you. In addition, I’ve provided a reference example at the bottom of this article from Target, which – as of this writing – has over 22 million followers on its Facebook page. 1. Post 1-2 times daily to start. 2. Create posts with exclusive content. Offer your followers a special promotional code, for example, or send a code to everyone who likes or shares a particular posts. But this doesn’t necessarily have to be a special promotion just for your Facebook followers. It could be something as simple as giving those followers advance notice of a sale or offer coming up soon. This will reiterate to them why there’s value in being your follower. 3. Use beautiful photos and videos. Rich media can be anything from product photos, to videos showing customers using your products. Rich media posts will always capture more attention in someone’s News Feed than text-based posts – primarily because the image preview buys you more space in that Feed! See Target’s example below – that’s a lovely, interesting photo. 4. Ask questions or use fill-in-the-blank posts. Don’t just tell, have a conversation. Ask questions (“What will you read this summer vacation?”) or ask customers to complete a sentence ( “During my summer vacation, the book I most want to read is _____________”). And please make sure to read through that conversation – your followers are often your best source of free advice for how to improve your business! 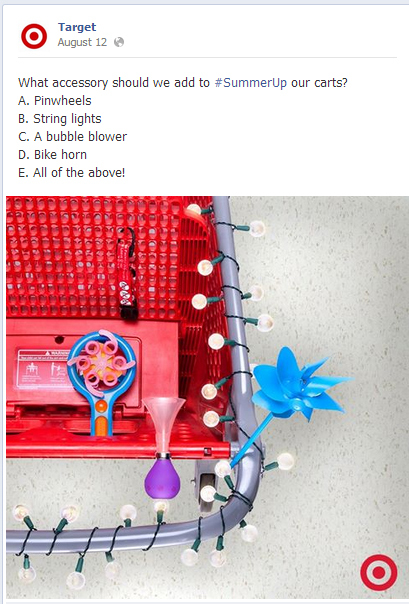 Again, Target’s got it right – they’ve provided a multiple-choice question. Stay up-to-date. Consider what time of year it is, what’s coming up (both for you and for customers), and what they might like to see. 6. Show posts to specific followers. If you have lots of followers – a great problem to have! – consider targeting specific posts to specific groups. Facebook provides more information on how to do this here. 7. Use #hashtags in your posts. If you’re familiar with the power of the hashtag on Twitter, you’ll know why Facebook recently launched this on their site. A hashtag (any phrase – without spaces – with a # symbol before it) helps other Facebook users who are interested in a particular topic find your posts. 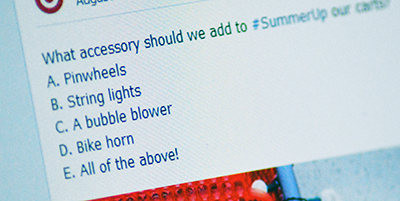 In Target’s example, they’ve created their own marketing vehicle by generating the hashtag #SummerUp. Did you know you can write a post today and schedule it for months from now? If you’re like me and like to work ahead, Facebook will give you 6 months of room. Here’s more information from Facebook in case you want to start scheduling now. Target – doing Facebook business page posts right. Facebook provides a unique opportunity to generate conversations between you and your followers. Use these best practices for Facebook business page posts, and you have a strong chance of succeeding in growing your business and learning how to make it better for your customers. See more in our social media best practices series.